I’ll admit it I am a massive Pinterest fan and spotted this from Belle Babes when I was meant to be looking for lunch ideas for my now toddler! He’s 15 months already and I feel like some days were the longest ever and already there are so many things that I miss about the early baby days. This week he toddled to the cupboard and pulled out his play gym. We popped it on the floor and he crawled in and lay down. He looked like a giant, not like the tiny baby I first laid on the mat and stressed about how much tummy time he was getting. I don’t know the last time he used it as a baby before it was put away with so many other things he grew out of. I wonder if I would’ve spent longer with him on the floor if I knew it was “the last time”? He still wakes at night and you know what, I like it. It’s our time, the world is dark and quiet and I love that I am the best thing in the world to my little man right then in that moment. I know the last time is coming, some days I will it to hurry up so I can sleep and not feel like I’m in a world of excessive jet lag. When the nights come and we have a snuggle, I’m really grateful for all of the time we’ve had and I want to breathe in every last bit of it and I don’t want it to be “the last time”. 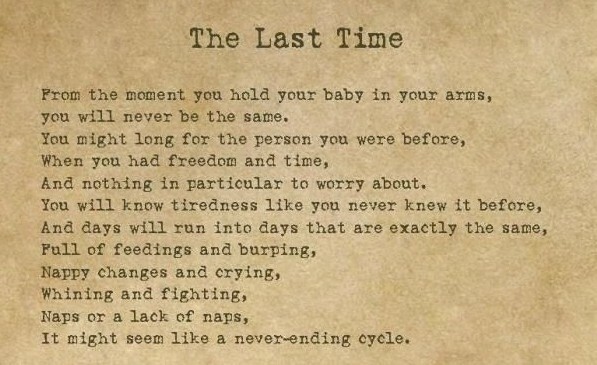 “From the moment you hold your baby in your arms, you will never be the same. You might long for the person you were before, when you had freedom and time, And nothing in particular to worry about. You will know tiredness like you never knew it before, And days will run into days that are exactly the same, Full of feedings and burping, nappy changes and crying, whining and fighting, naps or lack of naps, It might seem like a never ending cycle. What “Last Times” are you already missing? Breastfeeding…. the perfect time to shop online.